I like "plain sight" finds. This is the type of garage sale item that's right out there on the table for everyone to see, but most don't realize is a money maker. Any good garage sale picker knows the value of the obvious stuff like a Longaberger Basket, American Girl doll or a vintage Coca-Cola sign. Since everyone knows the value, good stuff like that usually gets snapped up quickly at most yard sales. But the "plain sight" stuff are those items that other buyers don't even notice because they seem so common. An example of this are the Coleman "Lil Oscar" coolers I blogged about recently. You see those coolers everywhere, so who'd think they sell for a lot of money on eBay? 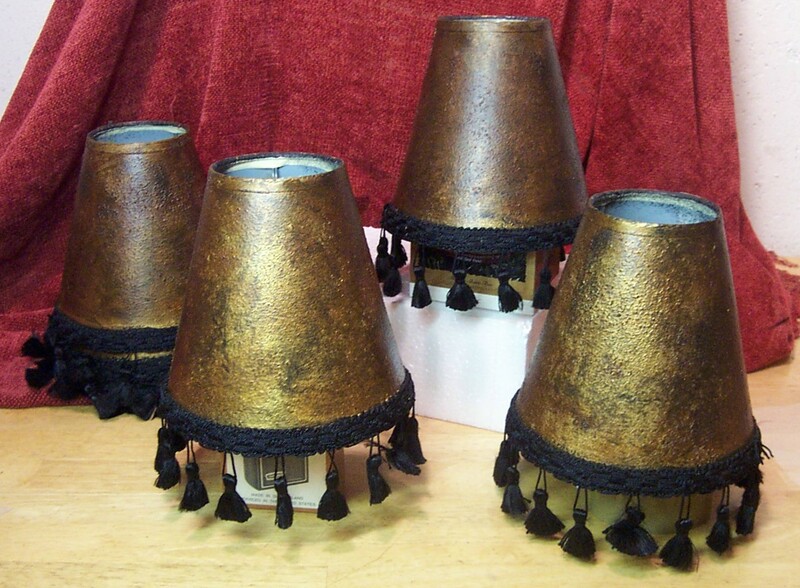 Well today's your luck day, because the Dude has another "plain site" item for you: Mini-lamp shades. I've sung the praises of mini-shades before but it's worth repeating. Think about it. How many garage sales have you spotted a set of mini lamp shades? They're as common at yard sales as George Foreman grills and dry flower arrangements! You probably walked right by a set last weekend right? Unfortunately you may have missed out on some money. But a word of caution first. Before I get e-mails from readers saying, "Dude, you steered me wrong! My lamp shades sank like a rock on eBay!" Let me point out one very important thing. 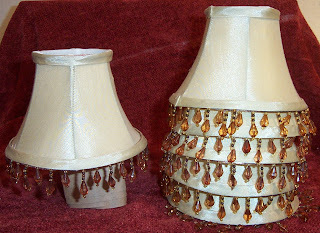 The common "Plain Jane" beige lamp shades do not sell well. It's the high-end style that's popular. Shades made with silk fabric, beveled sides and fancy beads are what buyer are looking for. So the rule of thumb is: the more ornate the shade, the more money you'll make! Who knew shades were so hot, right? But all you have to do is check out the retail prices of mini-shades at your local home decorating stores. Brand new shades can sell for $15 a piece at Target and $25 or more at Pottery Barn! Multiple that by five or six shades and you're talking a hundred dollars or more. A savvy buyer would do well to buy on eBay, instead of shelling out that kind of money. I didn't realize how popular mini shades were until I posted a set we had on our dining room lamp. I changed out the light, so the lamps shades became eBay inventory. I sold that set for $25 dollars. I was a believer after that sale! Check out the set in the top picture. I bought these shades for three dollars at a garage sale. (Three to five dollars seems to be the common asking price for mini-shades at most garage sales.) The bead set sold on eBay for an impressive $38 dollars! The goth-like group seen in the bottom picture were picked up for a single dollar. I think they're kind of ugly, but what do I know? I later sold them on eBay for $21 dollars! See what I mean? That's pretty good money for something that's overlooked by most yard sale buyers. Just a few hints when you're posting mini shades. Make sure to explain in your description how the shade attaches to the lamp. In most cases, the shade simply clips to the light bulb. But even though this seems obvious, if you don't explain it, buyers will e-mail you asking. Buyers also want to know the circumference of the bottom and top of the shade. For these reasons my photos usually show the inside of one shade, as well as ruler in the picture. By doing this, you'll save yourself from answering a bunch of e-mails asking for that information. I would also steer away from very plain mini shades. As I said, they're not worth the few dollars you'll make to list them. Now is really the best time to find and sell mini-shades. With Thanksgiving and Christmas around the corner, buyers will be looking for decorative items to spruce up their home for the holidays. So keep an eye out for mini-shades. They'll be hiding in plain site at most garage sales. Halloween is fast approaching! 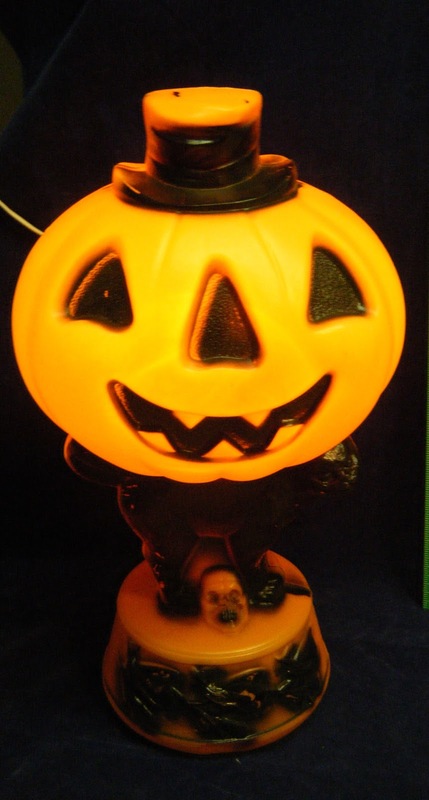 If you have any pumpkins, witches or black cat blow molds, now is the time to list them on eBay. I've sold a couple of Halloween items during October. Check out this blow mold of a Halloween pumpkin with black cat. You've probably seen this classic decoration everywhere, right? Me too, I can remember as a kid seeing them in windows in my neighborhood when we went trick or treating. Right now, there's a ton of these currently selling on eBay. I bought this one for only two dollars at my favorite little thrift store. It recently sold on eBay it for a twenty dollar bill. That was definitely a treat! You may also remember me blogging about a "freebie" I found back in June. It was a large plastic ghost holding a pumpkin. As luck would have it, I was heading home from garage sales when I spotted him. He was left out at the curb along with some other garage item clean-outs including a couple bikes and a plastic sled. This was a no-brainer as to what I should grab. I had no room in the garage for bikes and no desire to go sledding. At the time, I'd been learning about the popularity of holiday blow molds. Suffice it to say, the right ones can sell for big bucks! Throw in the fact that the ghost was free and you can be sure he was going in the back of my truck. I stored Casper away until a few weeks ago when I listed him on eBay. I could have listed Casper back in June, but there's two schools of thought regarding the right time to sell holiday items. In this case, the most obvious thing to do is list during the busy Halloween season when more buyers are looking. But there's a downside to this theory...you're not the only fish in the sea! Many like-minded sellers are listing their Halloween items too. In the case of my Casper, currently there are 15 identical ghosts just like mine for sale. While some are selling in the range of $20 to $30 dollars, others have no bids at all. If I had listed my ghost back in June there would have been a lot less sellers to compete against. Back then, I found only one similar Casper that sold for twenty dollars. But I decided to wait until October, calculating I'd be able to sell my ghost at a higher price. But when I finally listed my Casper on eBay, guess what he sold for? Only twenty five dollars! That's a measly five dollars more then the June sale. Based on this, you have to wonder if it's really worth holding on to an item in order to sell in-season? It's a quandary for sure, but if I had to do it again I think I'd still wait until October. While making five more bucks isn't huge, selling out of season could mean no bids at all. A no bid auction is a waste of money and time. Unless you run a store, Ebay charges you for each listing. Usually it's tallied against your monthly allotted number of auctions. And if you've already gone over your allotment for the month, eBay will charge you full freight. Either way-you pay. That's why I don't like to take a chance on running a holiday themed auction out of season. While I was hoping my Casper would sell for more, I still made twenty five dollars. That beats a no-bid June auction any day. But I am getting too "wonky" about auctions. The important thing is that I made $25 dollars from a curbside trash pick. Plus the story has a happy ending for Casper too! My buyer was only 45 minutes from the Money in the Garage studios. The Dude did a total solid for his buyer and personally delivered Casper to his new home. How's that for customer service? The buyer's house was pretty easy to pick out....check out the impressive blow mold collection on her front yard! If you look closely, you can see I left Casper right on the front doorstep. As I pulled away, I am pretty sure he waved goodby to me. We kinda grew fond of each other...I rescued him from the curb and in return, he made me twenty five dollars! Now that's a Happy Halloween! Do you shop at Target, Walmart or Garage Sales? We just finished a kitchen upgrade in our house. It all began over the summer when unbeknownst to me, Mrs. Dude decided the kitchen was ready for a re-do. But it's not like I was totally blindsided, I just didn't know how to recognize the signs. The first clue revealed itself one summer morning. 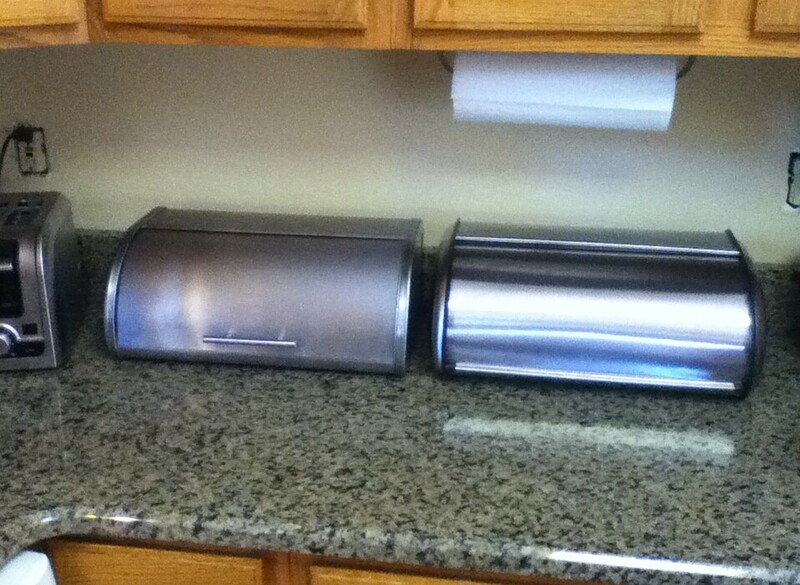 I came downstairs and noticed our old toaster had mysteriously disappeared. In it's place sat a stainless steel toaster with a fancy setting dial and a totally unnecessary blue LED timer clock. At seeing this, I should have immediately caught on. But instead, I chose to ignore this early warning sign of change. Then on the following morning, I discovered that our perfectly functional wooded bread box had mysteriously disappeared! In it's place sat a space-age looking stainless steel bread box. I immediately felt the hair on the back of my neck stand up! This subtle appliance swap-out was the meteorological equivalent of the first gusts of winds that signal a hurricane. Instead of a storm however, Mrs. Dude was whipping up a costly kitchen upgrade! Knowing you can't fight a hurricane, I chose instead to "shelter in place." I grudgingly went along with Mrs. Dude's plan and for the next few months made multiple trips to Lowes Home Improvement store. We ordered stainless steel appliances, granite counter tops and other dumb stuff that drained my wallet. We even became close, personal friends with several of the sales associates at Lowes. Even mindful of saving money, I have some great stories on working down the sales people on the prices of the kitchen appliances we bought. But this a garage sale themed blog. In keeping with that theme, let me share a garage sale score that saved us some bucks during the renovation. Remember that bread box I discovered sitting on the old countertop? Turns out, Mrs. Dude ordered the thing on-line from Target. Although I was afraid to ask, I had a bad feeling the tin box cost some serious jingle. This suspicion made me resent the shiny new bread box even more. With my resentment growing, I plotted to replace the tin box as soon as possible. It would be a bread box coup de'tat! Over the new few weeks, I kept my eye out for an inexpensive bread box at the garage sales. 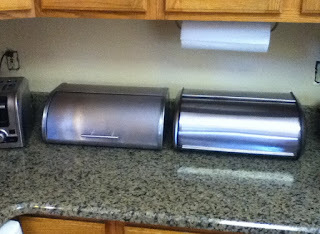 It finally paid off in August, when I found a near-identical stainless steel bread box. The price was only five dollars! However, before I started negotiating with the seller I needed to know one crucial piece of information from Mrs. Dude...did she still have the original box packaging for the Target bread box? I made a quick call home and after a long groan, Mrs. Dude verified she had the box the receipt. With the original box still available, I knew the Target bread box could be returned to the store for a refund. Now it was game on! Hoping to make a good score even better, I asked the seller if she would take three dollars for the bread box. She didn't seem thrilled about my counter, but accepted my three bucks anyway. With the acquisition made, the real work was about to begin. Would the replacement bread box pass Mrs. Dude's inspection? Arriving home, I nervously looked around the house to see if Mrs. Dude was within view. I implored my television watching daughter to give me a warning if she spotted her Mom approaching. Although the bread box was in nice condition, I needed some extra time to spruce it up before the official inspection. Feverishly wiping it down with Windex, I discovered what could have been a deal breaker. It had a Walmart sticker on the underside. This was extremely stressful for me because Mrs. Dude is a loyal "Target" shopper. She prefers the "Red" store over Walmart, finding them cleaner, brighter and easier to maneuver around in. Her Target loyalty over Walmart is similar to teenyboppers and their strong feelings towards either Team Edward or Team Jacob. Although I don't know where Mrs. Dude falls in that battle royale, I know for sure she's on Team Target! Walmart sticker or not, I had the bread box looking pretty spiffy. I was just finishing up when Mrs. Dude walked into the kitchen. The moment of truth had now arrived. I've come to learn that with Mrs. Dude it's important I not show fear. So instead, I totally faked confidence, handing over the bread box like Prince Charming handed Cinderella her glass slipper. Accepting the slipper, I mean bread box, Mrs. Dude let out a curious "Hmmmm" as she examined it. I couldn't tell if this was a good or bad sign. Time seemed to stand still as I waited for her to pass judgement. I felt like an anxious chef who just labored over a meal and could now only watch while the picky food critic tasted the results. She spotted the Walmart sticker, but to my surprise passed over it without comment. Handing the bread box back to me, she announced her decision, "Ok, it's fine." I let out a sigh of relief...the bread box passed the ultimate test! (In case you're wondering, my garage sale find is on the left in the picture.) In righteous victory, I proudly placed my bread box right next to the fancy Target model. Although both served the same function, there was a shocking price difference between the two metal boxes. Mrs. Dude found the receipt and I nearly fell over upon learning the Target bread box cost almost fifty dollars! I stood in stunned silence, wondering if Mrs. Dude had ever noticed that I have a slight obsession for saving money? I waited patiently to hear her insight regarding this lavish purchase. With moral support from our very amused daughter, Mrs. Dude smiled and sheepishly uttered, "Whoops" as her only response! I don't understand Mrs. Dude's thought process sometimes. After all, aren't we both suppose to be playing on the same team? Needless to say, the fancy breadbox was returned to our local Target store for a big refund. The garage sale breadbox went in it's place and the kids didn't even notice the difference. I saved fifty dollars, putting the money to use for other kitchen improvements. Like the color of the leaves peaking in the fall, the garage sales are likewise peaking. Just two weeks ago, there were so many sales that I actually could not get to every one! An unfathomable act for the Dude, but it just wasn't mathematically possible given the overwhelming amount of sales. Because of this saturation, I ended up missing about half of the yard sales. This is another one of of my garage sale pet peeves. Sellers don't seem to realize they're reducing the number of customers when they hold a sale during peak weekends in the fall. If they held their sale earlier or later in the season, more people would show up! But that's a discussion for another day. Even though on this particular Saturday I couldn't get to them all, the ones I did get to produced some excellent scores! One of those scores was this Imaginarium train table found at a neighborhood yard sale. This table is sold by Imaginarium as a complete set and includes tracks, trains, and buildings. (Some of the pieces are not shown here and were stashed in the storage drawer.) If you've read some of my previous posts, you know I am a big fan of the trains tables, particularly Thomas the Tank and Brio. While this table wasn't Brio, it was pretty much the next best thing. When I spotted this bad boy in a driveway, I zoned right in on it. The thing you always have to watch out for however, is how seller's price their tables. It seems like parents either sell them very cheap in order get them out of their house, or very high, because that's what they paid for the table new. There just never seems to be an in-between when it comes to train table prices. Knowing this, guess how this seller priced her Imaginarium table? If you said low, you'd be right. When I asked her the price, the lady quoted my $20 dollars. Working under my usual premise that it don't hurt to ask, I came back at her with an offer of ten dollars. Amazingly, she agreed and the next thing I knew she was helping me load the big table in the back of my truck! Now the proud owner of another train table, I commenced researching the actual retail price. To my giddy delight, I found "ToysRus" sells the table for $150 big ones! That was all I needed to know. After a few photos of the table in my garage, I posted my find on Craigslist for $125. While you might think that's a little high, I've found that when it comes to buying for their kids, many parents lose all common sense! If their kid wants that adorable train table, then gosh darn it, they'll going to buy it no matter what the price! My first prospective buyer did go against that mindset. This dad made an initial, feeble attempt to talk me down, but I was dug in on my price. Realizing this, the guy was on the cusp of buying the table when at the last minute, he cleverly did a little internet research of his own. The frugal dad then attempted to work me down with his new found research, informing that with an on-line coupon, he could buy a new Imaginarium table for about what I was asking for my used one. He then made it sound like he was doing me a hugemongous favor by taking the table off my hands for his offer of $90. I didn't doubt that this frugal dad could get a new table for my price, but I also knew I could easily find another buyer. I responded back in a understanding tone, telling him that buying "new" is always nicer then buying used. Which I don't actually believe, but I wanted to end the negotiations on an upbeat, friendly note. But what that dad didn't factor in was all the painful hours he would spend assembling a new table. By the time his sore, blistered hands turned that last screw, he'll have wished he bought my completely assembled table! Fortunately I didn't wait long for another buyer. While I was still e-mailing with ToysRus dad, I also had a mom making inquires about the table. I liked her e-mails much better...no ToysRus price quotes, low ball offers or guilt trips. She only wanted to know when and where her husband could come to pick it up? This mom was my kind of buyer! I made arrangements to meet her husband at a local convenience store on Sunday morning. When I arrived at the designated time and place, he was waiting for me with arms crossed and a cigarette dangling from his lips. He was a little gruff and not the most personable guy in the world. But I guess I'd be cranky too if my wife made me he get up early to drive nearly an hour for a train table. Despite his shortcomings, I liked the guy very much after he forked over $125 dollars to me! I helped "Grumpy" slide the train table into the back of his mini-van and away he went, smoking and grumbling all the way home! So that's how easy a flip can be during the fall garage sale season. I turned ten bucks into $125 dollars in just a few days time. Kinda makes you wish Fall could last forever, doesn't it?